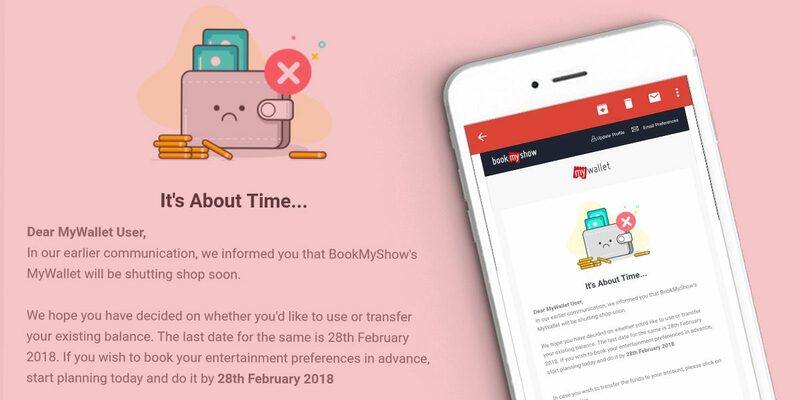 After Naspers-backed PayUMoney ceased its service, now online ticketing platform BookMyShow is shutting down its mobile wallet operations from February 28 onwards. The company email dedicated to subscribers mentions that BookMyShow’s MyWallet will be discontinued from the aforementioned date. MyWallet users can either exhaust or transfer existing balance to their bank accounts, mentions email. The platform was mired by the crackdown from Reserve Bank of India’s (RBI) new regulatory guidelines, shrinking usage of wallet and in the wake of increased appetite from users towards UPI-based option. Last year, the apex banking body asked mobile wallet providers to have a net worth of Rs 5 crore (up from Rs 3 crore previously) and complete Know Your Customer (KYC) mandatory for users who keep up to Rs 10,000 in their wallets. Unlike multiple mobile wallets that lack unified payment option (except, Paytm that has several use cases), UPI (Unified Payments Interface) based payment option directly connects users to a bank account through their phone numbers. Several consumer Internet companies are planning to pull the plug on wallet offering as it’s proving redundant with a UPI wave. UPI transactions had recorded 145 million transactions in December 2017, a 38 per cent jump in volume of the transaction as compared to a previous month. A major portion of transactions is being driven by smartphone-based payment applications such as Google’s Tez, Flipkart-owned PhonePe and Bharat Interface for Money (BHIM). Meanwhile, the Prepaid Payment Instruments (which includes both Mobile Wallets plus PPI Cards ) recorded 26 million drop in transactions during September 2017 as compared to the previous period in 2016. Three weeks ago, PayUmoney (the wallet arm of PayU) had halted its wallet PayUmoney. With a fast penetration of easy to use UPI-based payment option for fund transfer as well as merchant payment, mobile wallets are somewhere choking to justify their relevance. Besides, heavyweights like Google and local digital payment major Paytm, WhatsApp is slated to enter UPI bandwagon soon. Since WeChat is extremely successful in integrating in-chat payment in China, it would be interesting to watch WhatsApp payment feature with its over 210 million users in India. The development was first reported by VCCircle.